I really earned my elk hunt this year by working about 40 days for a private-land outfitter in northern Utah not far from Evanston, Wyoming. Rich LaRocco of Hunts.Net had booked me on this same hunt the previous year at a great price, and the outfitter had asked if I would like to work for my hunt in 2009. So that's how I came to drive my truck out to Utah again from my home in Michigan. I worked between Sept. 10 and Oct. 19. Most of the work consisted of chauffering hunters to and from the Salt Lake City airport, transporting elk and deer to a smeat plant and going to the dump to take care of our trash. In the process I met many great people and could not have been treated better. One day, Oct. 9, two hunters from Georgia and their guides asked me to go hunting with them. Well, I didn't say "No." We drove around and to the top of a mountin in side-by-side Polaris Ranger ATVs. As we started to glass, a guide immediately spotted two good bulls. We guessed that it would take us between 45 minutes and an hour to reach them. We went after them anyway. When we got to the place where we thought we might see them, the guides spotted a bull right away, but the elk ducked into the brush. It was satisfying to get my hands on the largest trophy animal I've ever taken. There's nothing quite like walking up to an elk that is several times as big as you with antlers this big. We moved about half a mile and spotted a big bull a little more than 300 yards away. 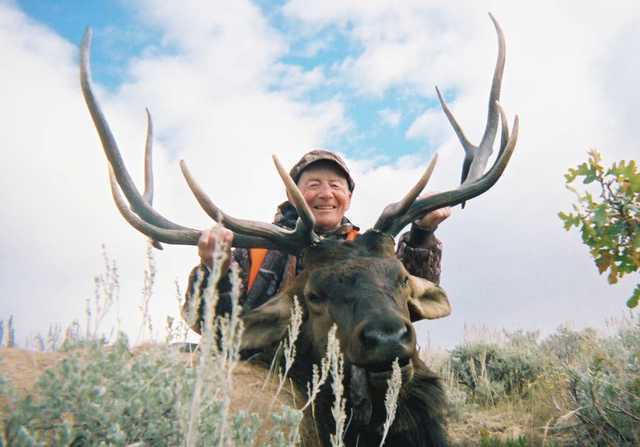 Both of the hunters from Georgia passed on the shot, saying the bull was too far away. The guides looked at me, and one them asked, "Can you make the shot?" My .300 Weatherby Magnum is zeroed in at 300 yards, so I said, "Sure!" The elk began trotting from my left to my right. Putting the crosshairs just in front of his shoulder, I squeezed the trigger, and down he went. We walked up to my bull, and he was amazingly beautiful and far bigger than anything I had dreamt of putting on my wall. 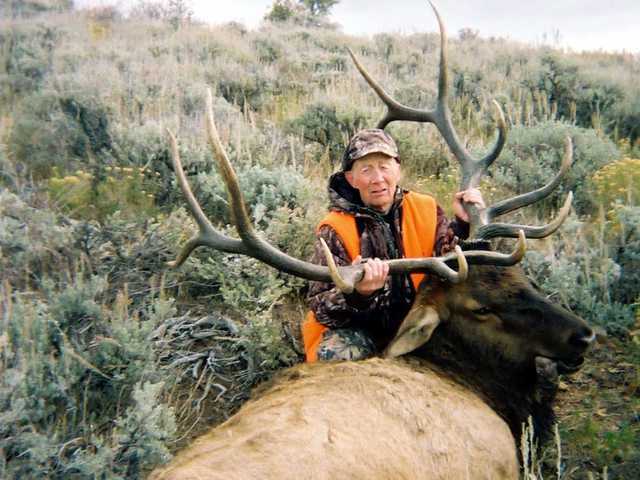 I've been hunting elk for many years from Montana and Colorado to Utah, and this bull was by far the largest elk I've taken or even had the chance to take. I appreciate everybody who helped make it happen. Great story Bill! Thanks for sharing. What outfitter did you use for this hunt?